Disclaimer: "All rights reserved to Cheritz Co., Ltd & Team Salvato. This is solely a not-for-profit fan activity". This took me at least 8 hours to make jeeeeeze xD I hope my shading improves. HAVE A NICE DAY~! Hi~! I made of ko-fi account, If you enjoy my content, please consider supporting what I do. Thank you~! Love it! thanks for the llama!! Hey, who is Zen and what is he from? Thanks a lot. Another question, what’s an otome game? I’m guessing a female dating sim? Ok. Sounds legit. So I’m a guy and it’s ok to play Mystic Messenger. Thanks! 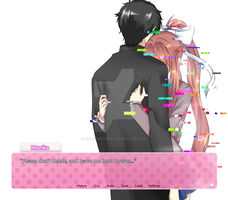 I saw this on your profile and I just wanted to stop by and comment since it's absolutely lovely; I'm always a sucker for Zen and I love the way you drew Monika as well, same for the background. I say it was 8 hours well worth it. Love the shading and line colours used for her hair! great, I want a coffe now!! Monika nice to see you again! 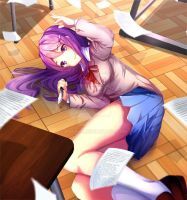 you're so good at drawing ddlc characters! Zen? He's cool and all but uuuuuuuuuuuuuuuuuuuuggggghhhhhhhhhhhh. I'm sorry. He's just a narcissist. And he hates cats. Still, this is awesome. I like Monika though. Possessive and creepy, yes, but at least she's not super self-centered. Very cute! Love the colors and poses! I love Starpugs Coffee! But their size names for coffee is weird. Teacup, Korgi, and St. Bernard. What? This is adorable Pastelaine-art. I like the details that you make! Really good! I like how you drew Monika! But I guess Monika as re-touch Moka word for insert her name.